Recipes to Make Rice Rawon of Surabaya Delicious Delicious .Recipe rice is a culinary mainstay for the people of Indonesia, because Indonesia has many kinds of food that me archipelago from Sabang to Merauke. One of the foods that are well known and popular for Indonesia is Nai Rawon msyarakat. 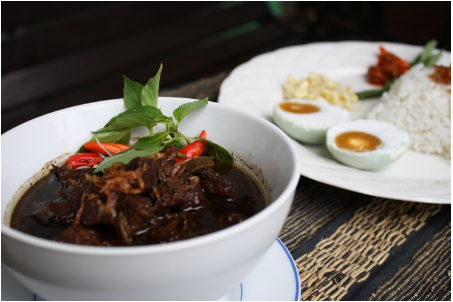 Rice is a typical food genuine rawon JawaTimur in the city of Surabaya, which has a typical sauce is thick and black that is made ​​from beef stew so the food is easily known and enjoy a lot of people. You are like a culinary various kinds of rice not to be missed with this one rawon resonance. To make rice rawon not so difficult, so that you can make in your home according to the recipe that we'll share it for you. Note the manner and process as well as materials in perlukannya below. After the prepared ingredients, first clean the beef until it is completely clean, then cut the beef to your taste. Provide water and boiled water and boil until cooked, put the lime leaves, bay leaves, galangal and lemongrass, boiled until boiling. Add beef and cook until the meat is soft and tender and other condiments that absorbs into the beef. Puree red onions, garlic, ginger, turmeric and other spices until tender, so that the results are good and perfect seasoning use a blender to make it faster. Set up the frying pan and saute the ingredients are already in puree until cooked and fragrant, lift. Put the seasoning into the meat stir stir until well blended. 0 Komentar Untuk "Recipes to Make Rice Rawon of Surabaya Delicious Delicious"